Ingredient composition of suppositories has complex antitumor, restoring effect, components of the composition interfere with the development of concomitant changes in the body. Composition: cocoa butter, mushroom cheer. Cocoa butter - has an emollient and moisturizing effect on the rectal mucosa, prevents irritation and dryness. 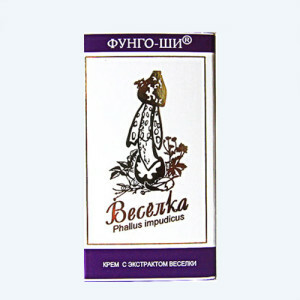 Mushroom veselka - promotes resorption of malignant and benign tumors, prevents the emergence of metastases, has healing and anti-inflammatory effect, increases potency. Mode of application: on 1 suppositories per day, course 10 days. For effective exposure, it is recommended to use water or soda enemas before use. Water: 800 ml of purified room temperature, 1 once a day for 1 hour before the introduction of the suppository. Soda: 800 ml of purified water, 36 g soda (1,5 tbsp spoon), mix the solution, use as an enema for 2 hours before the introduction of the suppository. The effectiveness of the combined use of soda or water enema and suppositories is clinically confirmed.